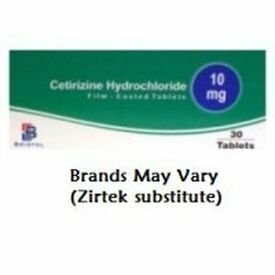 Cetirizine Tablets are used to treat the symptoms of hayfever and skin allergies. Cetirizine treats people suffering from hayfever, perennial allergic rhinitis and allergic skin reactions. Cetirizine Tablets are used to treat the symptoms of hayfever and skin allergies. Cetirizine treats people suffering from hayfever, perennial allergic rhinitis and allergic skin reactions. Antihistamines like cetirizine reduce the unpleasant symptoms and discomfort related with the above conditions. Itchy, red and watering eyes. Suitable for children from the age of 6 years.